Grab the harness by the dorsal (Center-back) D-ring. Tighten the leg straps, waist straps and shoulder straps. Snap-hook falsely engaged with a harness D-ring. 1) Empty your pockets. When you fall in your harness, the harness both squeezes your body and slides upward as the arresting force is applied. Anything you have in your pants or shirt pockets will also be squeezed into your body before being slid upward. Multi-tools, pens/pencils, keys, cell phones, and even cans of smokeless tobacco can cause serious injury depending on the pockets they are placed in and the type of fall experienced. 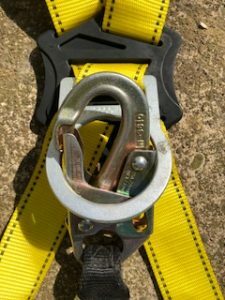 Many fall protection and rescue harnesses these days include pockets specifically designed to store these items and keep them out of harms' way. Items carried in cargo pockets (on the side of work pants) may be less susceptible to creating this type of hazard but in a fall (which may be head-first) anything is possible. 2) Conduct a buddy check. Once your fall protection harness is properly fastened, adjusted, and connected to the lanyard or SRL, we always recommend that users ask a nearby worker to check it over. Twisted straps can be hard to see once the harness is on, as are loose ends that are hanging and likely to get snagged. Another real possibility is what is called "false engagement." This situation (shown in the accompanying picture) can occur when people are attaching snap-hooks to their dorsal D-rings without being able to see what they are doing. As you can see the snap-hook can feel like it's connected. Even if you jiggle and shake it, it might not come loose, but imagine how you'd feel if you were working away at elevation and a co-worker noticed that your connectors weren't connected or the lifeline on your SRL suddenly came off your D-ring when it was jostled just so. A fall protection harness has saved many lives but like any PPE you need to follow specific practices. Over time those practices will turn into habits. Hopefully you can train and encourage those at your location to add these two simple steps to your harness donning procedure.